By Contributing Author 2 Comments - The content of this website often contains affiliate links and I may be compensated if you buy through those links (at no cost to you!). Learn more about how we make money. Last edited October 2, 2015 . Financial plans are good things to have. They can help you maneuver difficult times, knowing that as long as you stay the course, you’ll probably be OK. They can also help you stand strong when other people get nervous, like when the stock market isn’t performing well. But there are certain times when it is appropriate to take a second look at a long-standing financial plan. Priorities change with time, but sometimes they change suddenly. It’s during moments like these that can be the perfect time to rework your personal finance system. Here are some times in life that reevaluating your priorities will be a good idea. When You Get Married. Marriage isn’t for everyone, but for those who enter into a relationship like this, it’s important to make sure your finances are adjusted appropriately. Not only will you want to create a joint account or two, you’ll also want to adjust your spending, saving, and investment habits. In addition to all this, you should consider writing a will and finding life insurance through Termlifeinsurance.com or other qualified source. This is a time in life when it’s not a bad idea to get serious. So take a close look at your finances, and invite your new partner into the conversation. Make sure you’re on the same page, with a unified plan going forward, and your marriage will have even more chance at success. When You Buy a House. This is another one of those moments when it’s important to figure out where all of your money is going. Budgets should be maintained all the time, but we all know they slip and slide from time to time. Before you buy a house, you should look over your budget and credit history with a microscope. Find out your credit score and, if necessary, spend some months rehabilitating it in order to secure the best possible APR for your mortgage loan. Make sure you are saving enough to cover the down payment. Also, make a budget for how the mortgage will get paid every month, how you’ll cover home furnishings and renovations, and how many aspects of your former financial life will be maintained. When You Have Kids. If you ever decide to have children, this is a very important time to reevaluate your finances. Some parents like to put aside funds for their kids as soon as, or even before, they are born. These can be left to grow and help pay for college later. If your general finances aren’t in order, kids can be a good time to say it’s time to fix them. Before having children, try to eliminate debt, and start saving and investing regularly. Also, the recommendations in #1 go doubly for anyone with children. Any day is a good day to get your finances in order, but everybody knows that it’s hard to make this happen without having a good motivation. These three life events should be motivation enough to get your finances in the state they should be all the time. So take the opportunity and make your life better from here on out. Top finance blogs can only make recommendations. You have to do the rest. 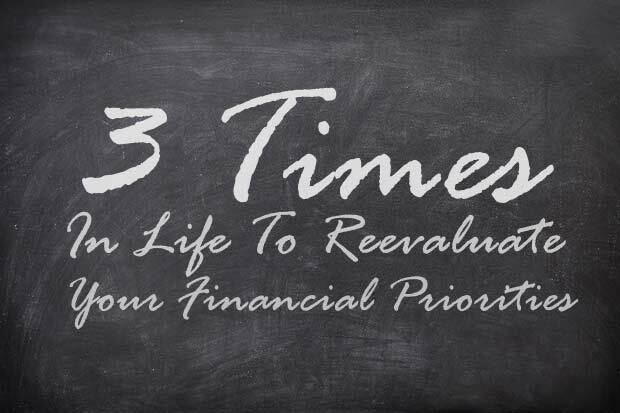 Are there times that you would consider a perfect time to reevaluate your financial plan? 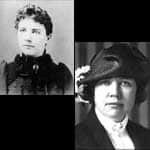 Laura Ingalls Wilder and her daughter Rose had very different approaches when they came upon hard financial times. How would you react to financial stress? Last Edited: 2nd October 2015 The content of biblemoneymatters.com is for general information purposes only and does not constitute professional advice. Visitors to biblemoneymatters.com should not act upon the content or information without first seeking appropriate professional advice. In accordance with the latest FTC guidelines, we declare that we have a financial relationship with every company mentioned on this site. Yep, all of those milestones are pretty important. If we have a kid, we’ll definitely have to make some changes to our budget. But it’s also good to reevaluate your priorities once in awhile for no real reason — especially if you’re not getting the progress/results you were hoping for. I really want to pay off our mortgage early, but we’re not putting anything near enough into our retirement accounts. So I’ve decided I shouldn’t increase our mortgage payment next year (as much as I reeeaaally want to) and put more into retirement. Can relate to all 3 reasons in the order of #1,#3,#2. Marriage was probably most difficult for us because two become 1. We are both financially responsible so the other two weren’t that bad except we decided to have a baby and build a house at the same time. For having a child, I recommend reconsidering your will & life insurance for starters as they are cheap and simple. Besides that, you will soon realize life is dictated by baby’s schedule instead of yours. Doesn’t mean all your money goes to the baby however.